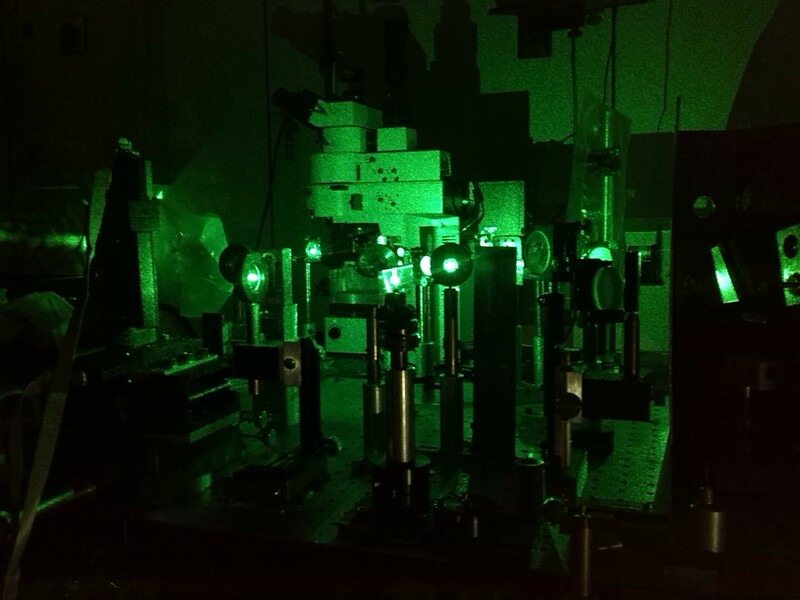 In this Lab we perform studies on the elastic and optical properties of different kinds of materials through the analysis of their scattered light (Brillouin Spectroscopy –>>BS). The frequency shift of the scattered light is proportional to the propagation velocity of an acoustic wave in the material. We study transparent and opaque materials both in bulk or film shaped. In the first case we focus our studies on the evolution of the elastic and optical properties with temperature and pressure which are connected to structural changes. In order to perform spectroscopic studies the lab counts on a 6 pass in tandem –>>JRS-Scientific Instruments spectrometer and on a –>>Spectra-Physics BeamLock Laser (Ar+) with controlled Etalon (–>>Spectrometer description from Prof. Dr. B. Hillebrands’ web page). For the MicroBrillouin technique we use an Olympus BX51 microscope with 10X, 20X and 50X objectives. Temperature variation is achieved using a He cryostat “Optistat” and a temperature controller ITC-503, both of –>>Oxford Instruments. In this way we are able to perform measurements between room temperature and 5K. High temperatures, up to 500ºC, are obtained with a “Homemade” small optical thermostat and the pressure experiments are performed in a Diamond Anvil Cell (DAC). The angular characterisation (sagittal and azimuthal) is assured by a motorised rotating system, allowing a high accuracy in angular positioning.